This article is reproduced by permission of the Zoryan Institute. 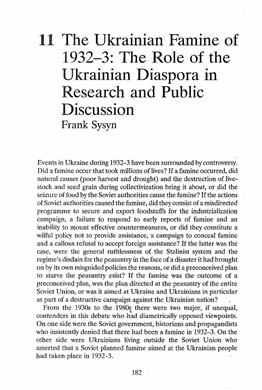 Frank E. Sysyn: The Ukrainian Famine of 1932–3: The Role of the Ukrainian Diaspora in Research and Public Discussion. Frank Sysyn. 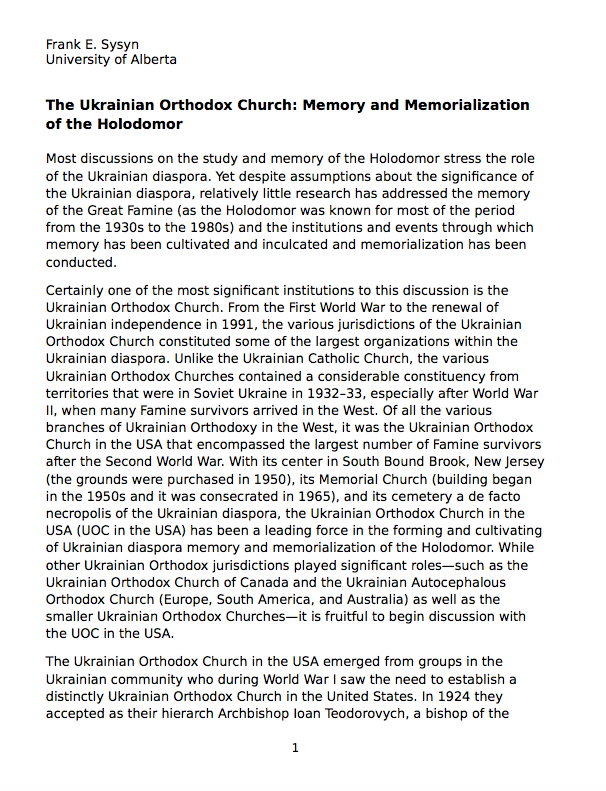 The essays posted here were written in Ukrainian and address topics that have not been closely examined in the English-language literature on the Holodomor. 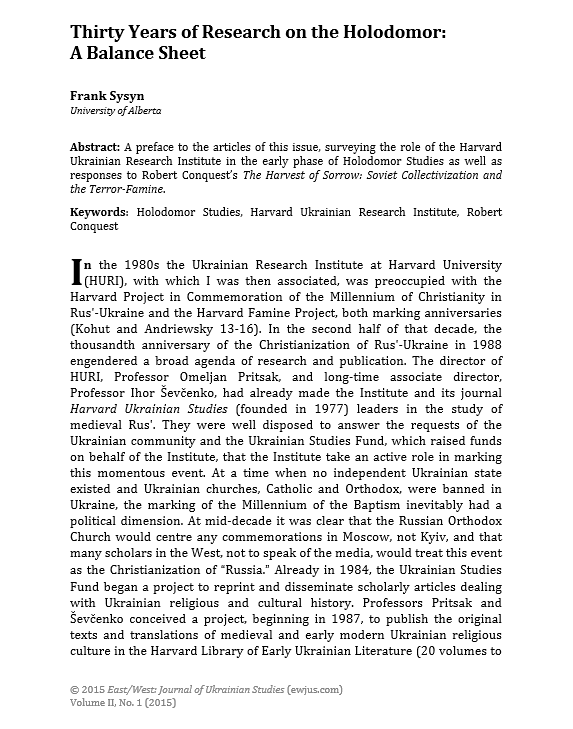 The article by Viktor Danylenko and Petro Bondarchuk focuses on cultural matters, discussing the Ukrainization policy, its termination beginning in the period coinciding with the Holodomor, and the implications of the change in policy for Russification in Ukraine. 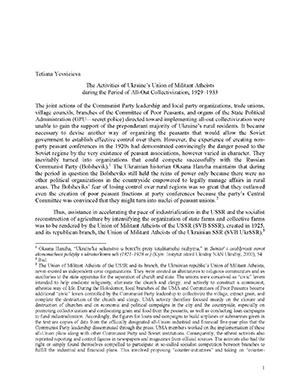 The authors emphasize that the central government and party leadership in Moscow viewed the national question and the grain procurement campaign in Ukraine as interconnected. 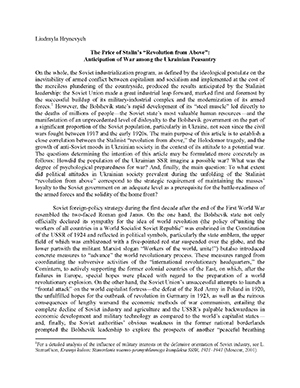 Mykola Doroshko’s essay examines the role played by the Soviet Ukrainian leadership during the Holodomor. The success of the forced collectivization campaign and grain collections depended on the ability and willingness of the republic’s national, regional, and local leadership to follow and execute the directives of Stalin and the Kremlin, which required applying repressive measures and faminogenic polices. 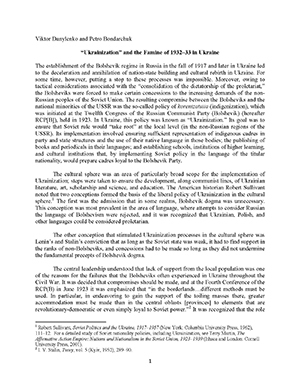 Doroshko provides evidence of some resistance among Ukraine’s leadership to Stalin, but also of servility and compliance. He shows that during a period when millions were starving, local leaders who resisted were punished severely, while those who scrupulously carried out orders reaped material benefits (and upper level party and government leaders had access to luxury goods, perks, and privileges). 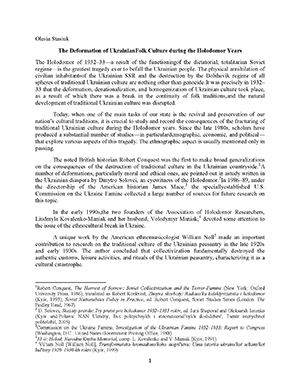 Liudmyla Hrynevych’s article deals with the topic of pro-war sentiment among the Ukrainian peasantry, which increased as a consequence of collectivization, dekulakization, and the Holodomor. From 1928, sentiment in favour of war began to rise, perceived by the peasantry and peasant soldiers stationed in Ukraine as their best hope for salvation from the worsening socioeconomic situation in the country. The authorities, alarmed by the growth of anti-Soviet sentiment and the potential of mass disloyalty in the event of war, recorded a rise in favourable views of foreign powers, including Nazi Germany. 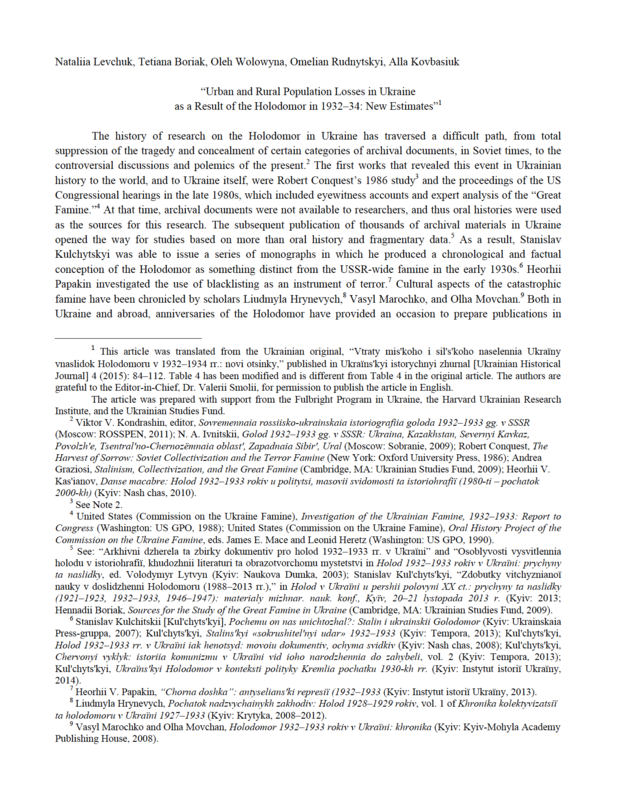 The article written by the demographers Nataliia Levchuk et al. 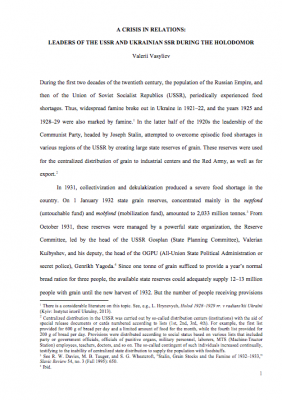 examines demographic losses during the 1932–33 famine, presenting for the first time losses in urban and rural areas of Soviet Ukraine. It shows that not only rural but also urban populations suffered significant losses, with the total number in 1932–34 being 4.5 million persons, consisting of 3.9 million excess deaths and 0.6 million lost births. During this period, excess deaths numbered 39.3 per 1,000 in the population in urban areas and 164.5 in rural. The article discusses significant urban-rural differences in population dynamics during the 1927–39 period. It also considers how during the famine years, the hierarchical system of food ration cards affected chances of survival for different subpopulations, depending on their relative importance in production processes. Heorhii Papakin addresses the policy of blacklisting, whereby villages and other administrative entities were subject to repressive measures for not fulfilling grain procurement quotas. Penalties included trade bans, deprivation of goods, including ordinary consumer items, closure of bank accounts, pre-term collection of loans, and the levying of fines through the confiscation of cattle, domestic foul, and personal belongings. 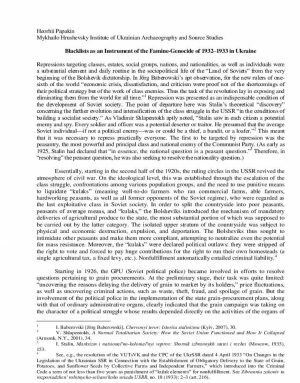 The author concludes that in Ukraine, blacklisting became a weapon of genocide, creating conditions that were incompatible with the existence of human life. 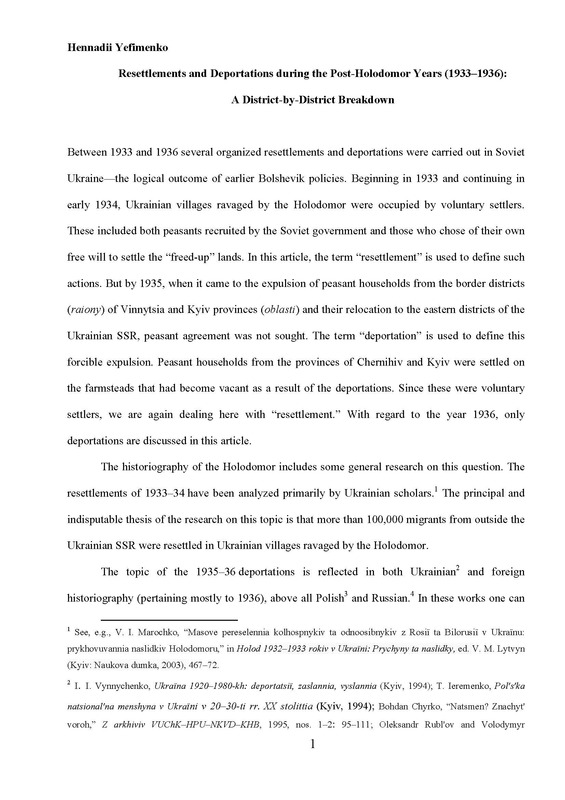 Yuri Shapoval examines the important role played by Vsevolod Balytsky, who headed Ukraine’s GPU (the republic-level security service) during the Holodomor. 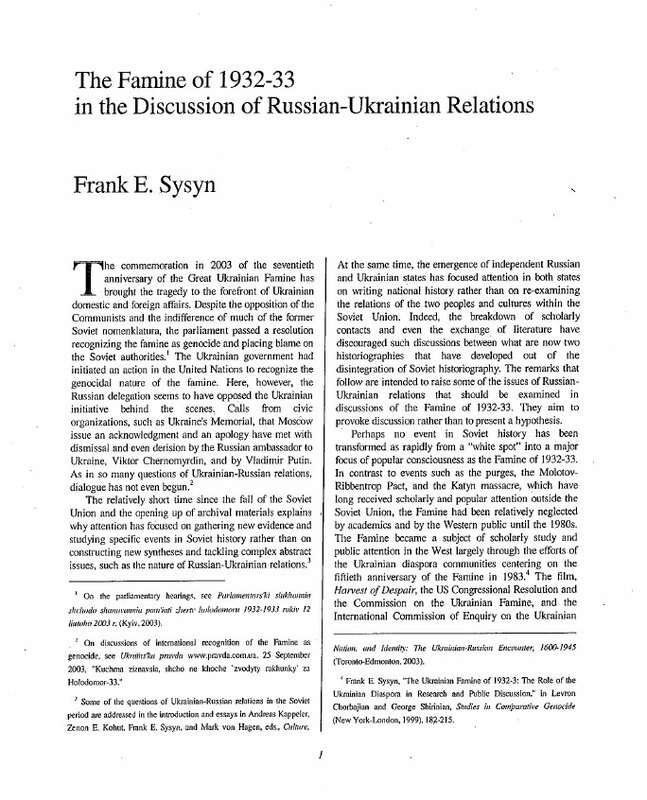 Shapoval notes that in ordering Balytsky’s return to Ukraine to take over the GPU, Stalin was motivated by the worsening economic crisis in 1932 and the desire to establish direct control over the Ukrainian republic’s leadership. Balytsky, who was described as “an absolute Stalinist with a remarkably strong will and iron discipline,” intensified special measures such as mass arrests and deportations in order to crush peasant resistance to the Kremlin’s unrealistic grain procurements and launched repressions against so-called Ukrainian nationalists. Balytsky also aided Pavel Postyshev, who was dispatched by the Kremlin to take over the leadership in Ukraine in January 1933, consolidating Stalin’s control over the republic. 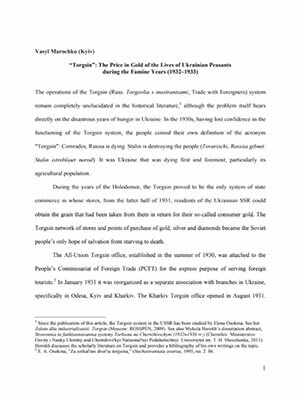 Olesia Stasiuk examines the destruction of traditional peasant values and traditions during the Holodomor, in particular, the impact and consequences of the Communist Party’s and Soviet state’s repressive and anti-religious policies on the traditional cultural life of the Ukrainian peasantry. These policies, together with severe measures that impoverished the peasantry, caused famine and destroyed many successful farmers and their families. The peasantry’s family- and religious-based traditions and values were altered, and the traditional bonds and respect for older generations were eroded. 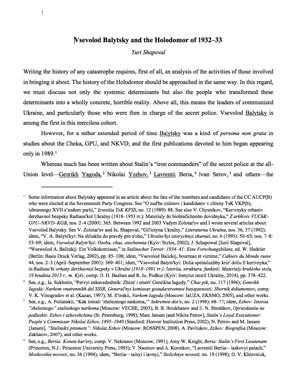 Valerii Vasyliev examines the relationship between the all-Union Soviet leadership, led by Stalin, and the upper-level leadership of the Ukrainian state and party apparatuses during the Holodomor. 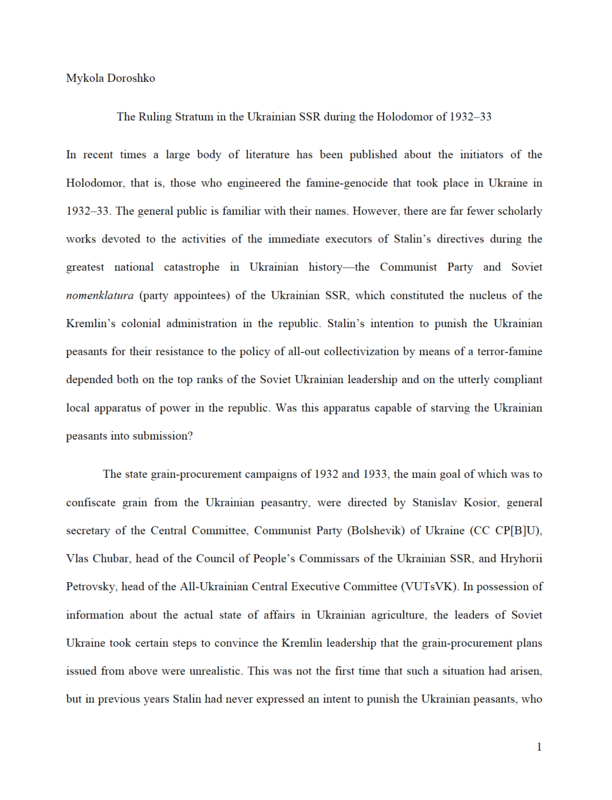 Vasyliev traces the steps taken by Stalin and the Kremlin leadership to abolish the already limited authority of the Ukrainian leadership, resulting in their complete subordination to the Kremlin center. Political power thus became increasingly concentrated in the Kremlin’s leading body, the Politburo led by Stalin. 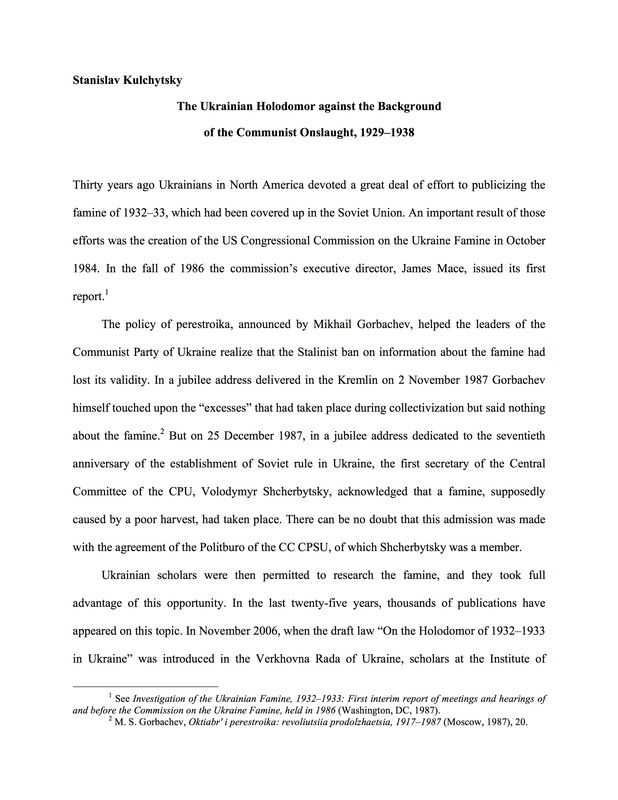 Vasyliev emphasizes that the Holodomor was accompanied by the arrests of tens of thousands, deportation of thousands to forced labour camps, executions, mass political purges, and persecution of Ukrainian intellectuals and of the Ukrainian church.